View cart “Breakfast at Trout’s Place by Ken Marsh” has been added to your cart. This classic story shows the dramatic life history of one salmon from her hatching through her mating – the fulfillment of her life cycle. Haig-Brown captures the whole sweep of the chinook migration in every significant detail: the departure seaward of the millions of small fry in the spring of the second year, the saltwater life of the free-swimming schools in the deeps beyond Puget Sound, and the return and mating of the survivors. 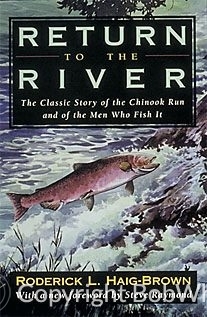 Return to the River remains one of the finest books ever written about the salmon and has won its place as an angler’s and naturalist’s classic. Roderick Haig-Brown was born in England but lived his adult life on Vancouver Island, along the banks of the Campbell River. He is the author of To Know a River, A River Never Sleeps, Silver and other important books.